Celebrity chef Jean-Christophe Novelli is bound for Derry to cook cook up a storm at the Foyle Maritime Festival. The famous Frenchman will be in Derry on Friday, July 15 at Ebrington. Jean-Christophe will be displaying his culinary talents during Derry & Strabane Council’s Clipper Race Kitchens event in the city, which runs from July 14 to 17. The multi award-winning Michelin chef, TV star and author will bring his distinctive French flair and creative excellence to the free admission, four-day family-friendly food extravaganza. Popular local celebrity chefs Jenny Bristow, Paula McIntyre, Noel McMeel, Brian McDermott and Ian Orr will also be headlining at Clipper Race Kitchens. The event is expected to be one of the biggest held during Northern Ireland Year of Food and Drink 2016, supported by the Department of Agriculture, Environment and Rural Affairs (DAERA) NI Agri Food programme, Tourism NI and the Loughs Agency. The Mayor, Alderman Hilary McClintock, said she was hugely impressed by the stellar line-up secured for the Clipper Race Kitchens. 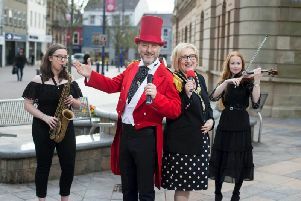 “Council is to be applauded for organising what promises to be an absolutely superb showcase of our finest local food produce and culinary talent as part of the wider Foyle Maritime Festival programme,” she declared. Mary Blake, Council’s Tourism Development Officer and organiser of Clipper Race Kitchens, is hoping for record attendances, with an estimated 40,000 people expected to flock to the four-day culinary extravaganza on the Ebrington site. Jean-Christophe Novelli is a 5 out of 5 AA Rosette and Michelin award-winning chef, who began his career aged 14 as a baker in his home town of Arras, Northern France, before becoming the private Head Chef to Elie de Rothschild, of the French banking family, at the age of 19. He was head chef at Keith Floyd’s pub, ‘The Maltsters’, as Head Chef, whilst Keith was filming his famous TV shows, and in 1996, Jean-Christophe opened four restaurants in London and now runs the Novelli Academy from his home in Hertfordshire, providing training for chefs. He has made numerous guest appearances on TV cookery shows including Saturday Kitchen, Chefs Academy and Hell’s Kitchen as well as on This Morning, Loose Women and Countryfile. Clipper Race Kitchens will have three main food zones on Ebrington Plaza, including two huge festival marquees. In addition to the LegenDerry Boulevard of Chefs with 12 local restaurants cooking signature dishes. priced from around £5, and Theatre of Food with live cookery demos and sampling in the Clipper Race Kitchen marquee, there will also be a Flavours of the Foyle showcase. The Clipper Race Food Pavilion will showcase around 40 artisan producers selling their delicious wares, while the Clipper Race Village will be serving up the finest local street food from selected chefs/vendors out on the Plaza. The family-friendly food event, which opens from 12 noon on July 14th-17th, will also have a kids zone with arts and crafts as well as water boats, jungle playground, cheroplanes and live music to keep everyone entertained.